Nearly a century ago, thanks to the foresight of a generous few, close to 50,000 acres of land were set aside to become the U.S.’s first national park east of the Mississippi. Today, Acadia National Park in Maine awes two million visitors annually with its glacial lakes, granite mountains, and rocky coastline. One visit will never be enough to this national park. There are endless activities for every age and fitness level, including cruises, whale watching, boating, and horseback riding. Outdoor enthusiasts will appreciate Acadia National Park's 127 miles of hiking trails, ranging from relaxing strolls to nearly vertical granite climbs. You can also take in the park at a faster clip by biking the 45 miles of Carriage Roads. These stone roads were a philanthropy project by John D. Rockefeller Jr. in the early 20th Century. Today, horseback riders, hikers, and bikers take full advantage of the vehicle-free roads. You can even reserve a sight-seeing carriage ride to enjoy the spectacular scenery. Appreciate the views from the water with a leisurely day paddling on the crystal glacial lakes (and those brave enough can dive in for a swim). Canoe and kayak rentals are available throughout the park. For those who prefer a guided visit, kayak tours are offered in small groups (ranging from 6 to 12 people), and leave at various points throughout the day, including sunrise and sunset. There's no way you can make a visit to Maine without trying lobster. Acadia National Park is situated right on the coast, and they have the freshest catch to show for it. Head to Abel's Lobster Pound, which boasts an unbeatable setting overlooking the Somes Sound. Top off your lobster dinner with a slice of their homemade wild blueberry pie - another Maine staple. Latin spice meets North Eastern coastal at Havana restaurant. It’s located in Bar harbour, the most popular town near the park, famous for its charming seaside feel and its many shops and restaurants. Havana is a highlight of Bar harbour dining, and meat lovers, vegetarians, and seafood addicts will all find something to salivate over. This crowd favourite seamlessly integrates Maine staples into traditional Caribbean dishes, and with a wide selection, great ambiance, and attentive service. It’s not to be missed. Within the park, after the day’s activities, refresh yourself at Jordan Pond House. They’re known for their legendary popovers and afternoon tea, but have a full menu as well. Keep your accommodations as memorable as the national park itself. Skip the chain motels or hotels and opt for the homey touch of Acadia House Inn, located in the bustling city of Bar harbour. The inn features nine unique rooms, each with its own character. But the real star of the show is the breakfast, which the owners take pride in whipping up every morning using fresh and local ingredients - including eggs from their hens out back. For a more wallet-friendly option, there are two main campsites in the park. Blackwell Campground is open year-round, and is located just five miles south of Bar harbour. Seawall campground is open in high season, from late May through September, and is situated four miles south of Southwest harbour. 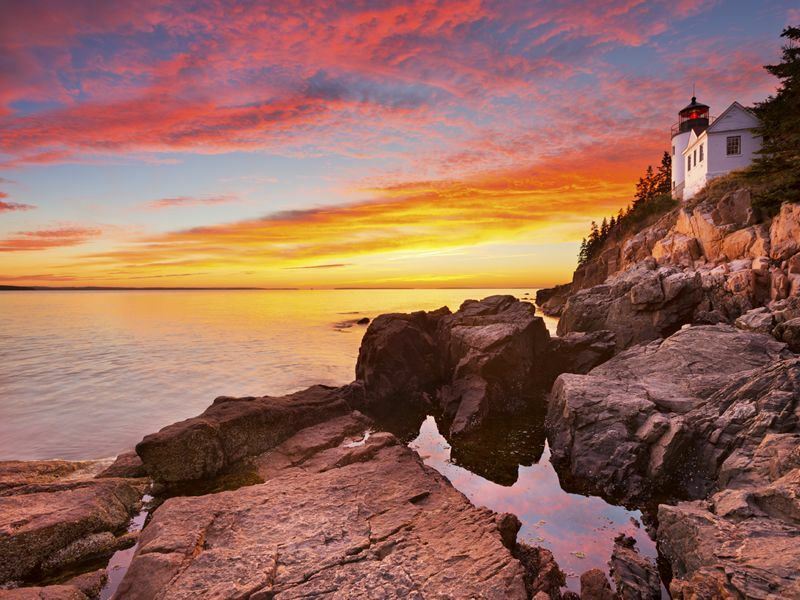 More information and to book: Self-drives such as the 16-day Classic New England tour offers an itinerary including Boston, White Mountain, Cape Cod and of course, Acadia National Park.